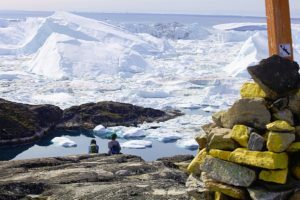 Ilulissat is the tourist hub of Greenland and the main reason for almost 10.000 tourists a year to visit is its proximity to the UNESCO World Heritage Site of the Kangia Icefjord. The Ilulissat Icefjord (Greenlandic: Ilulissat Kangerlua) is a fjord in western Greenland. Ilulissat Icefjord was declared a UNESCO World Heritage Site in 2004. 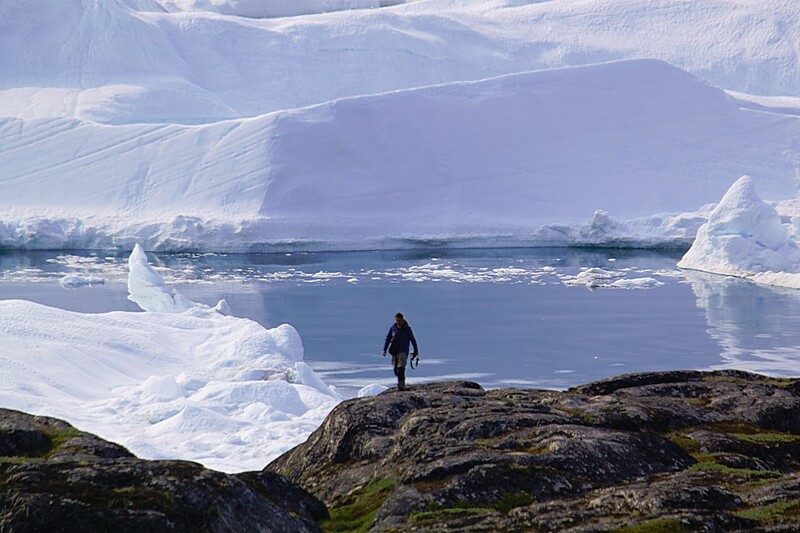 The Ilulissat Icefjord runs west 40 km (25 mi) from the Greenland ice sheet to Disko Bay just south of Ilulissat town. At its eastern end is the Jakobshavn Isbræ glacier (Greenlandic: Sermeq Kujalleq), the most productive glacier in the Northern Hemisphere. 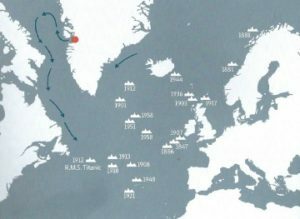 The glacier flows at a rate of 20–35 m (66–115 ft) per day, resulting in around 20 billion tonnes of icebergs calved off and passing out of the fjord every year. Icebergs breaking from the glacier are often so large —up to a kilometer (3,300 ft) in height— that they are too tall to float down the fjord and lie stuck on the bottom of its shallower areas, sometimes for years, until they are broken up by the force of the glacier and icebergs further up the fjord. On breaking up the icebergs emerge into the open sea and initially travel north with ocean currents before turning south and running into the Atlantic Ocean. 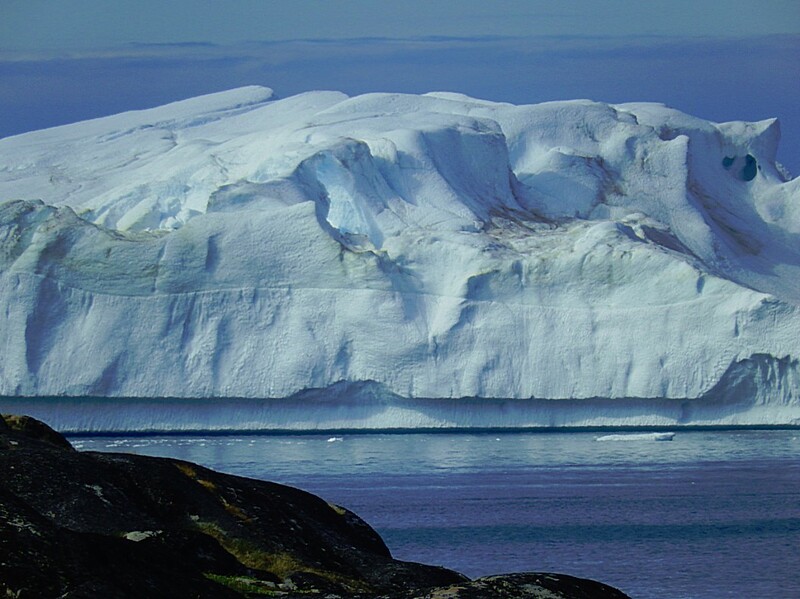 Larger icebergs typically do not melt until they reach 40-45 degrees north —further south than the United Kingdom and level with New York City. When we talk about the Arctic and Antarctic regions of the world, almost all people think of snow, ice and icebergs, but whereas there are plenty of areas on the southern hemisphere producing icebergs, there is actually only a limited area on the northern hemisphere where they are produced. Antarctica on the southern hemisphere is a frozen continent and lots of glaciers streaming from that continent produce icebergs, however, on the northern hemisphere, in the Arctic region, we find a frozen sea, not a continent. Sea ice is much thinner than land ice. The only ice cap in the north is the Greenland inland ice sheet and this is actually the only place where icebergs are produced. The Sermeq Kujalleq glacier is the most productive glacier on the northern hemisphere, producing tons of really huge icebergs. After an iceberg calves from the glacier it plummets into the Kangi icefjord and drifts towards its mouth at the Disco Bay just south of Ilulissat. The fjord has an average depth of about 1 kilometre and this is deep enough for the icebergs to float unhindered. But at the mouth, the fjord’s depth is only 300 metres, because of a moraine obstacle that was left there by the glacier, millions of years ago when it had reached to the mouth and started to retreat. The largest icebergs can’t pass this heap of moraines and they get stuck, sometimes for a few years, before pressure build up caused by the icebergs behind that keep coming. Then the large icebergs start to break and float of in to Disco Bay following the Ocean Currents, 1st north and then south. Does the Global warming have effect on the ice sheet of Greenland? Judge for yourself. I was not able to see the effect in the short span of time of my visit, but researchers have done research in the Kangia Icefjord and at the Sermeq Kujalleq glacier for a long period of time and their graphics show that in the last decades, the melting proces of the glaciers on the edges of Greenland has increased dramatically. flows at a higher speed, from 20 metres per day in 1998 to 40 metres a day in 2008. These are all signs that the ice is retreating faster, away from the coast. The next phase means it will retreat on the land too. The land is dark and absorbs heat from the sun much quicker and more, than the frozen sea water and the icebergs that now border the glacier. This means that in future the glacier will retreat even faster. But it also means that the land which gets uncovered will warm up and the permafrost will melt. If that happens, natural gasses that were frozen in for millions of years, will escape into the earth’s atmosphere and this will heat up our climate even more. The glaciers and eventually the icecap will melt even faster. 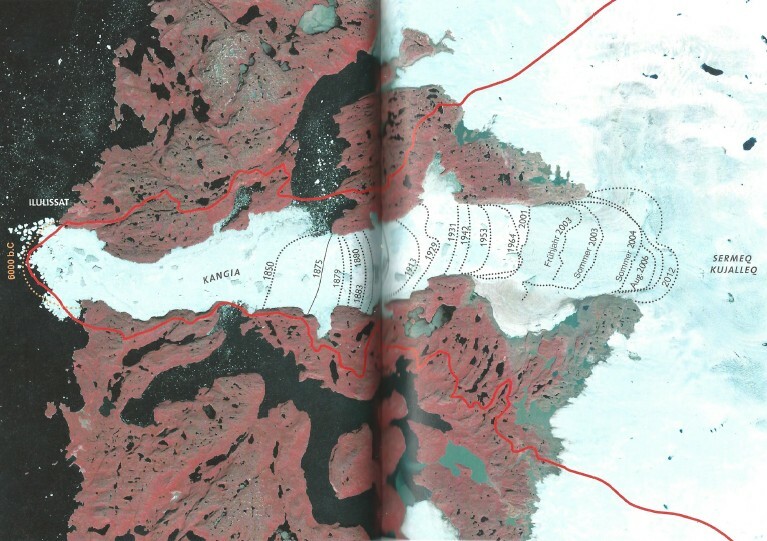 The above images shows the increase of the glaciers retreat speed over a couple of decennia. The glaciers retreat speed increased severely after 1850, but went haywire after 2001. The 1st increase came some decennia after the Industrial revolution (The Industrial Revolution was the transition to new manufacturing processes in the period from about 1760 to sometime between 1820 and 1840). The 2nd increase started some decennia after an explosive growth in CO2 emissions. Between 1970 and 2004, global growth in annual CO2 emissions was driven by North America, Asia, and the Middle East. The sharp acceleration in CO2 emissions since 2000 to more than a 3% increase per year (more than 2 ppm per year) from 1.1% per year during the 1990s is attributable to the lapse of formerly declining trends in carbon intensity of both developing and developed nations. China was responsible for most of global growth in emissions during this period. 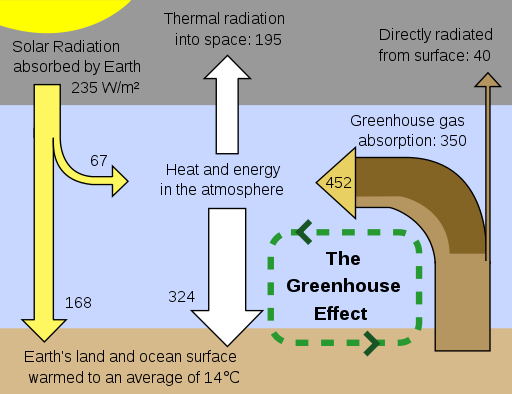 If climate continuous to heat up, this might have an influence on the ocean currents. They won’t dissappear but they can change directions, which will have major impact on climate and short term weather. The main reason why there is an ice sheet on Greenland (and not in Europe, Canada or Russia) is because of the ocean currents. Greenland is surrounded by relatively cold currents, whereas e.g. Europe has a relatively mild climate because of the relatively warm Gulf Current. 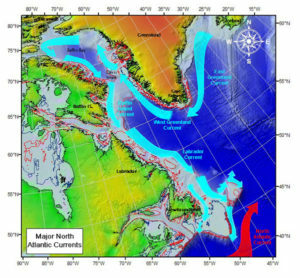 If the melting of the icecap increases, sea water level will rise. This is of course more dramatic for under developed countries like Bangladesh or islands in the Indian Ocean, but it’s also of major influence on the coastal areas in Europe and in the US. This means more expenses on the defense agaist water level rise. 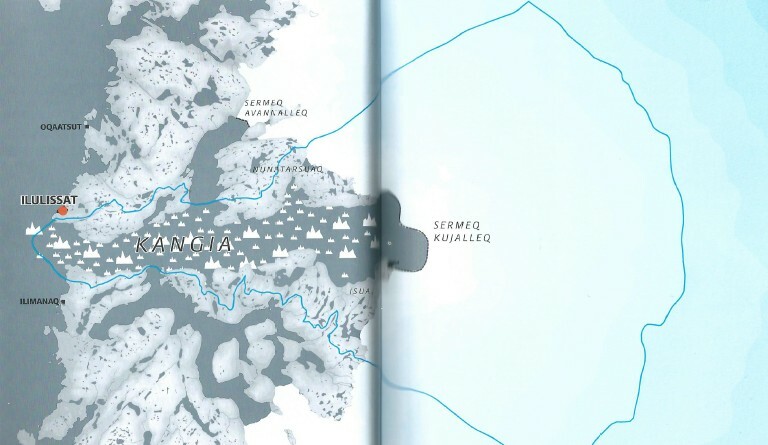 At the southern border of Ilulissat are 3 starting points for 4 hikes along the Kangia Icefjord, which are depicted on the map and on the signs en route as the Red, Yellow and Blue trails. The fourth route is the UNESCO wooden trail towards the fjord. Walks start at the Elvaerket (Electicity plant) (yellow), Heliport (WHT, Red, Yellow, Blue), Stenbrudet (Stone Quarry) (Blue). The Wandelgek wanted to walk them all. Of course, but due to circumstances which I’ll write about in later blogs, he succeeded in hiking two thirds of the trails. The yellow trail, the red trail and part of the blue trail including the UNESCO wooden trail. He had to skip a beautiful part of the blue trail though which is the most difficult part to hike. World Heritage Trail: 2.6 kilometres/1hr walk (1.3 kilometres in both directions/0.5 hours in both directions). Easy Access – (Wooden trail) walks for everyone, including people with conventional wheelchairs and pushchairs, using easy access paths. Comfortable shoes or trainers can be worn. Red Trail: 2 kilometres/1hr walk (1 kilometre in both directions/0.5 hours walk in both directions). Leisurely – walks for reasonably fit people with at least a little country walking experience. May include unsurfaced rural paths. Walking boots and warm, waterproof clothing are recommended. Yellow Trail: 2.7 kilometres/1.5 – 2 hrs walk. Moderate – walks for people with country walking experience and a good level of fitness. May include some steep paths and open country, and may be at a brisk pace. Walking boots and warm, waterproof clothing are essential. Blue Trail: 6.9 kilometres/4 – 5 hrs walk. Strenuous – walks for experienced country walkers with an above average fitness level. May include hills and rough country, and may be at a brisk pace. Walking boots and warm, waterproof clothing are essential. In the next blogs and vlogs, I’ll talk about the walks I did finish. Just one reminder: I found the estimated walking times to be correct, however, the natural spectacle that is unfolded before your eyes when walking makes it impossible to not linger for a very long time at the icefjord and if you’re visiting for the first time you might want to double or even triple the estimated time spans 😉 .